This interesting library interior is from the Grace building of 42nd Ave., New York City. This is all quality custom cabinetry made in Canada by ‘Patella’. The cabinets are made of a combination of hard woods with a faux Walnut veneer over them. 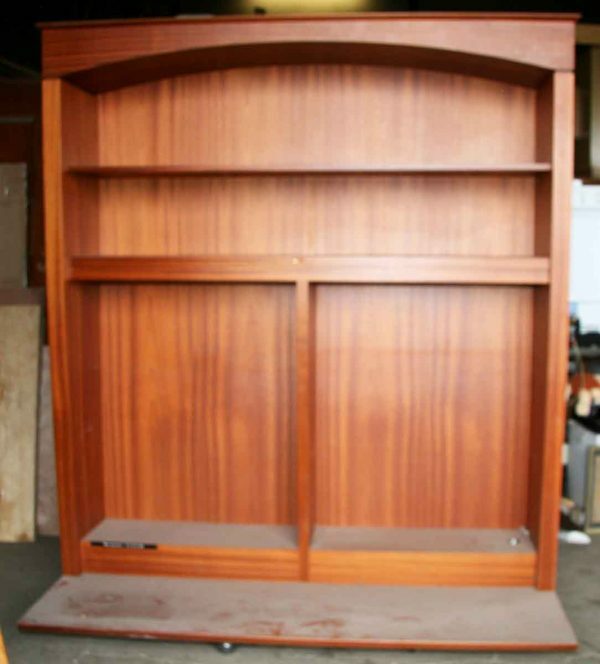 They have a clean look with various shelves, nooks and show cases for displaying books and other items. The first picture shows a book shelf with built in study desk (needs top – marble or wood) with pigeon whole slots on either side of the desk. This unit stands 110 in. H. The second picture shows three more shelf units which when mounted on their bases (shown in picture 7) they also stand 110 in. H. The shelves are 15 in. D i.d. and have a study table top which sets on top of the bases. When set up the entire cabinet is 30 in. D and the table top portion is 16 in. Deep. The left and right shelf units are each 54.25 in. W while the middle shelf unit is 70.75 in. W. They also have slots on the sides for mounting 2 ft. wide shelves between each unit, so when fully set up with the extra shelves, the 3 piece unit spans 124.5 inches. wide and is 30 in. D at the base and 16 in. W – O.D. at the top. The base units are mounted on casters, when taken off the units will be 6 in. shorter. The next item pictured is a pair of glass show cases – We don’t have the shelves for these, but I think glass would look terrific. These units stand 98 in. H overall, including the glass shelf case as well as the study table it is mounted on. These units are 60.5 in. W x 21 in. Deep shelf portion and 30 in. deep with study desk portion. All units are electrified and in good condition. 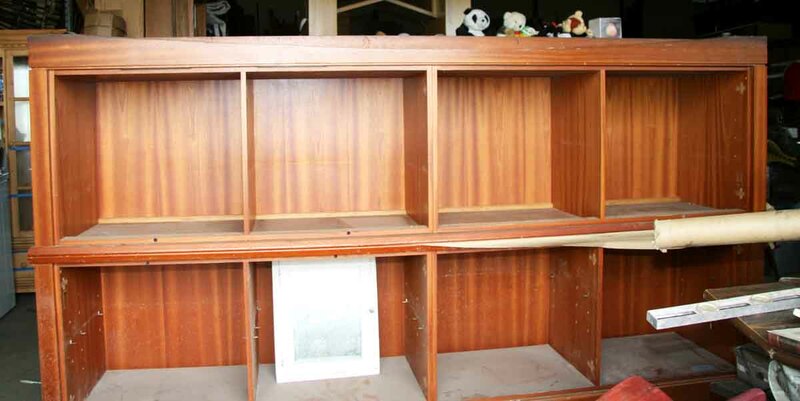 They seem to have been made to have cabinet doors, as we can see the hinge outline. These are not available – perhaps the library found them to be a nuisance and would rather see their books rather than the cabinet doors! 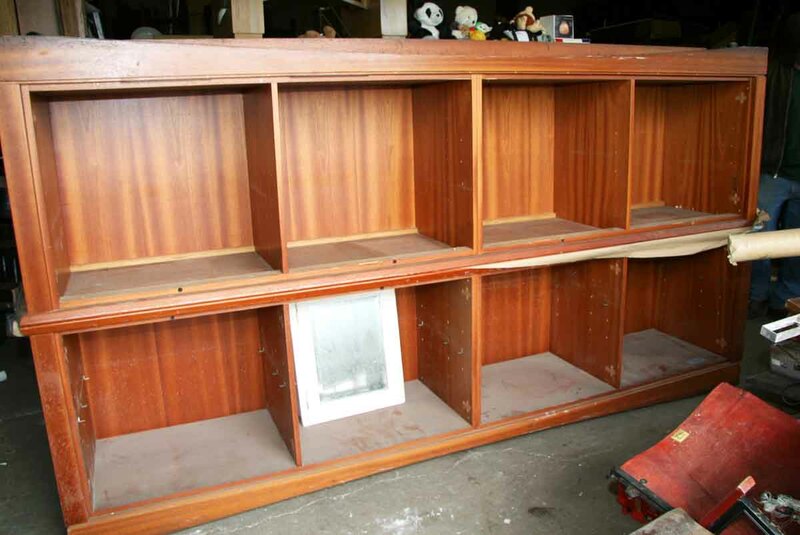 All of these cabinets separate between the base and the top, so you could use them as shelves without the bases. They would then be 78 in. H shelves. The last item included in this lot are two huge conference size library tables (again on casters for easy role in and out!) Each table is 10.5 in. L x 44 in. W x 32 in. H. on each side of the table are book cubbies which are 26.25 in. W x 24 in. H.